According to GSMA data, 5 billion people in the world own mobile devices that can be connected to the internet. The majority of these devices are used to store, access, and share confidential business files and information on a daily basis. In reality, there is no doubt that smartphones make our everyday lives easier. They are small, compact, and simply convenient for use on the go, whether it is for personal or business purposes. However, despite the convenience and the ability to access important files anywhere, mobile devices are more of a vulnerability for a business, rather than a useful asset. Working remotely and using mobile phones to get small tasks done from any location sounds great but, once you calculate the risks that come with it, the usage of mobile devices for business no longer seems appealing. Here are four reasons why mobile devices pose a threat for businesses in any industry. The thing about mobile devices is that everybody owns one. If you take a look at it from a security perspective, every single person in your company is a liability to your business. Even if 90% of your staff take good care of their devices and implement proper security measures, only one person’s mistake can put the entire team at risk. If banning access to files and information via mobile phone is not an option, you will have to educate your employees on potential security risks, as well as regularly remind them to take care of their data and devices outside the office. Mobile phones are small and lightweight, which makes them so convenient and easy to use. On the downside, these characteristics make smartphones easy to steal or misplace. Losing your device or having it stolen most commonly results in unauthorized physical access where the person who gets their hands on the device can access all its important data and files. If the smartphone gets into the wrong hands, you could be looking at a greater threat, including data theft and possible financial consequences. Mobile devices should never be left unattended and they should be kept safe at all times. People often connect their mobile devices to public networks at coffee shops, malls, restaurants, and other public areas. These networks offer us free access to the internet but they come with a far greater number of drawbacks. Public WiFi networks are unprotected, which means that almost anyone can intercept your connection and steal your personal information and files. The thing with remote workers is that they like to change their work environments so they often take their devices to public spots such as coffee shops. This can leave your company’s data exposed to a large pool of hackers waiting to catch their prey for the day. 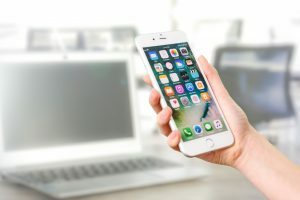 One way to keep mobile devices safe when connecting to public networks is through the use of VPNs, which you should recommend to your employees. A mobile device doesn’t have to be stolen for its files and data to be compromised. Hackers have created numerous methods for exploiting people's smartphones, stealing their data, and inflicting damage on devices. All it takes is a simple online scam website or a phishing email and those who don’t have experience with these cybercriminal methods will be caught in the net. Make sure to educate your employees on all potential threats, including scams, fake links, and phishing sites, in order to keep your business data safe. If you were to list the pros and cons of using a mobile device for business purposes, the list of cons would certainly be much longer. However, most of these risks can be avoided by using a Virtual Private Network and staying educated on the recent cybersecurity methods and solutions. To check how well your company is doing when it comes to mobile device safety, call a meeting to discuss this topic with your employees.